Cornblit, whose professional name was simply Joey, led the American team to a bronze medal at the World Amateur championship when he was 15. The Miami native turned pro at 16, playing for Miami Jai-Alai. He was the first American-born player to become a world champion. He holds the record at Dania for the most wins, with 186 games during the 1988-89 winter season. He retired in 1995, ending a 24-year career. 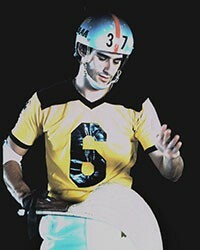 His number 37 is the only Jai Alai jersey to be retired.